Jul 17, 2017 at 01:10 PM | 421 Views | Last edit Jul 17, 2017 at 02:42 PM 2 rev. TCode MN05 --> Selected the output type 'NEU' ---> Entered the Condition Record --> Selected the condition record and clicked on 'Communications' tab --> Entered Output Device 'MAIL' and PO &EKKO-EBELN& Vendor &LFA1-NAME1& in 'Cover Page Text' --> Save. How to change file name of Print data.pdf ? I have the same question. 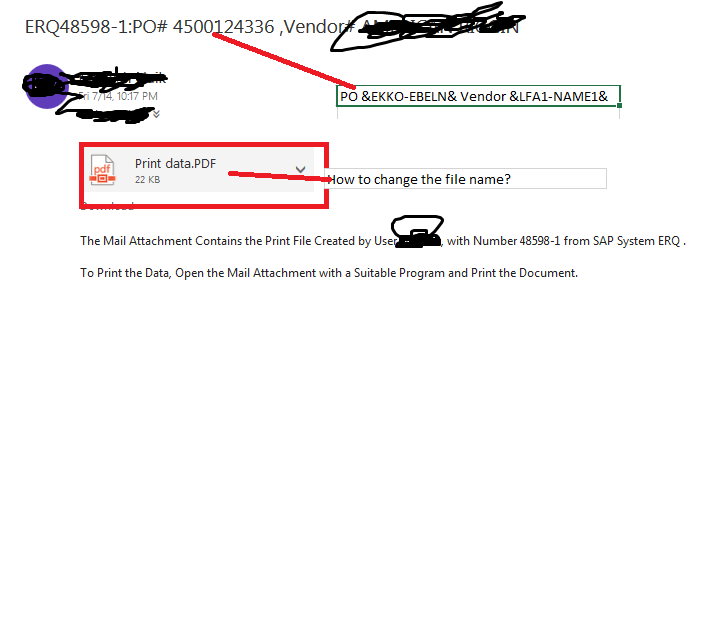 I have been able to change the subject of the email but I cannot find a way to change the PDF file name 'Print data.pdf'. Any update on this question?